United Nations Secretary-General Antonio Guterres and US President Donald Trump open the Global Call To Action On The World Drug Problem at the United Nations in New York, Sept. 24, 2018. Opening the high-level week of the United Nations General Assembly in New York Monday, U.S. President Donald Trump spoke about the Global Call to Action on the world drug problem. Speaking alongside U.N. ambassador Nikki Haley, Secretary of State Mike Pompeo, and National Security Advisor John Bolton, Trump cited a 60 percent increase in drug-related deaths around the world in the past 15 years. "As the 2018 world drug report highlights, cocaine and opium production have hit record highs," Trump said, noting the need to curb both supply and demand of drugs around the world. The Global Call to Action was announced by the White House last month. Some 129 countries signed the one-page pledge in order to attend the UNGA meeting with Trump Monday morning. "The call is simple: reduce drug demand, cut off the supply of illicit drugs, expand treatment and strengthen international cooperation. If we take these steps together, we can save the lives of countless people in all corners of the world," he said, adding that "when I say "countless," I'm talking about millions and millions of people." United Nations Secretary General Antonio Guterres, left, shakes hands with President Donald Trump during the "Global Call to Action on the World Drug Problem" at the United Nations General Assembly, Monday, Sept. 24, 2018, at U.N. Headquarters. 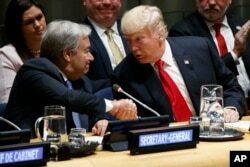 Trump also thanked the member countries of the United Nations Monday morning, saying U.N. Secretary-General Antonio Guterres "has become a great friend and is doing a wonderful job on a complex situation, but a beautiful situation." "I'm thrilled that every country in the room today has agreed to answer our call, and I want to thank each and every one of you for your commitment to this important initiative. The United States looks forward to working with you to strengthen our communities, protect our families, and deliver a drug-free future for all of our children, " he said. Guterres thanked Trump for his words and his initiative to combat the global drug problem, following his remarks Monday morning. "You are focusing a spotlight on the global drug problem, and we have never needed it more," he said. On Tuesday, Trump will address the U.N. General Assembly. On Wednesday, he will chair the world body's Security Council meeting. The session at the U.N. Security Council, where the United States currently holds the monthly rotating presidency, was to focus on criticism of Iran. But now, will be broadened, Haley said.